Our last posts in our Mac Mini Media Centre series looked at Plex and Boxee, two great media centre applications. However one issue I haven’t covered is Remote Controls. What is the best way of controlling your Mac Mini? There are a variety of options and hopefully one of them will suit your needs. The most obvious control solution is the good old keyboard and mouse. I was lucky in that I had an older bluetooth Apple Keyboard and Mighty Mouse. For me that’s fine as I won’t really use them that often, instead relying on some of the other solutions I describe below. If you need to buy a keyboard and mouse then one little bit of advice – don’t buy a Mighty Mouse! I’m not a fan of the new Magic Mouse either but thats really just personal choice. If your going to buy a mouse I’d go for a Logitech. As for keyboards, there’s a bit more choice. 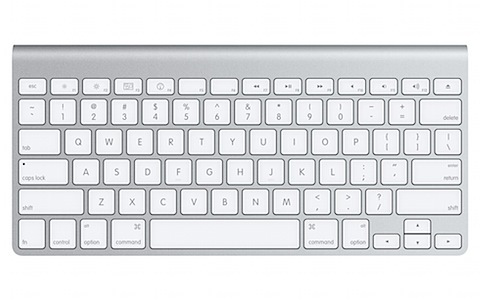 For one you have the newer Apple wireless keyboard. It looks gorgeous, is light on batteries and is tiny. Exactly what you need for a living room keyboard. If only it had a touch pad at the side it would be perfect. Looking elsewhere, Logitech has a nice option with the diNovo Edge. It’s a rechargeable keyboard with a built in touchpad. It looks great and would be a fantastic controller for the Mini but tech that looks that good doesn’t come cheap – £139. Ouch. 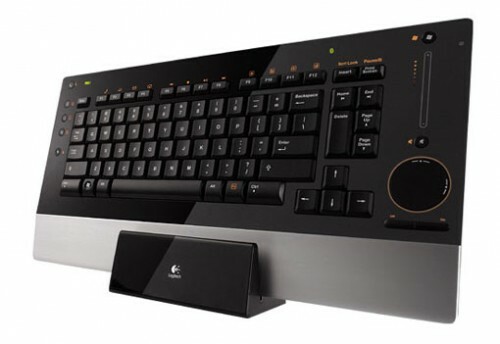 One keyboard that’s a lot cheaper and you might overlook is also from Logitech – Mediaboard Pro for PS3. This a bluetooth keyboard that also includes a touchpad with the only problem being the windows keyboard layout but it works perfectly well on a Mac and is only £49.99. Bargain. Keyboards and mice are fine but the Mini is acting as a Media PC and as such I want to use a remote to control it most of the time. The obvious option is the Apple Remote. This little remote is straightforward but will allow you to control quite a bit of your Mini. Front Row and iTunes are fully controllable with the remote although you can’t do any searching from it as there’s no keyboard. Plex and Boxee are also fully controllable. 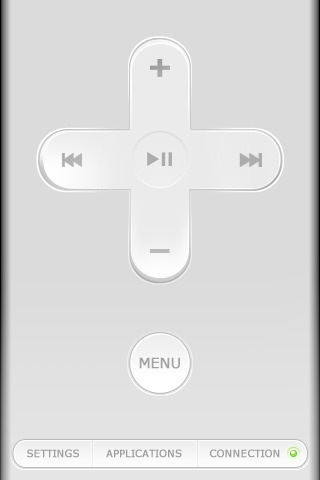 If you run Boxee or Plex almost solely on the Mini then you can get by without anything more than the Apple Remote. It’s just a shame that Mac’s used to come bundled with a remote but it’s now a £15 extra which is quite pricey for what it is. A more complete remote option is the Harmony range from Logitech. Not only can the Harmony replace all your other remotes and control your hardware, it can also work with your Mini. There is support or a wide variety of software but taking a look at the Plex wiki shows that it’s neither straightforward or without issue. If you already have a Harmony then it looks a good option but I won’t be rushing out to buy one anytime soon. If you have an iPhone or iPod Touch there are an increasing number of remote controls available, some far more powerful than the IR remotes mentioned above. So what are the options? First app that should be installed is the Apple Remote (iTunes link). This connects to iTunes and allows you control your iTunes library. Once installed you can pair the app with as many iTunes libraries as you have in your house. When you launch the app you select a library and then you can browse and playback any music in your library. This doesn’t play through your iPhone or iPod though – you are merely controlling playback on your computer, in this case the Mini. The app is very feature rich though – select from and create playlists, use and update Genius playlists, search the whole library, view album art on the iPhone/iPod and even select the speakers to playback through. 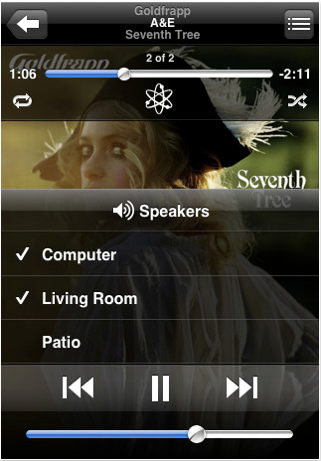 It’s free and well worth installing – I just wish you could send music to the iPhone/iPod as well. That would make the app perfect. Rowmote Pro (iTunes link) is an app that really does make controlling your whole Mac Mini possible from the iPhone/iPod Touch. To work you first must install the Rowmote Helper application on your Mac which is available free from the Rowmote website. Once installed you connect to the iPhone app and once complete you then have an Apple Remote (the physical Apple Remote) on your iPhone. The advantage of this remote though is it works over wi-fi – no line of sight issues with this remote. The app also does far more than the hardware remote. You can wake and sleep your Mac, connect to multiples Mac’s from the one remote, remembering that line of sight isn’t an issue. You can also swap between applications by selecting from a list or by clicking on a dock icon which is displayed on the iPhone. That covers the £0.59 Rowmote app. The Rowmote Pro version, at £2.99, adds a wireless touchpad and keyboard. This works amazingly well and means you can control virtually everything from your iPhone or Touch without a keyboard or mouse. Searching in Spotify is easily done from Rowmote Pro and it really is a bargain application. Another app that works similarly to Rowmote is Air Mouse Pro (iTunes link). This too needs a helper app which can be downloaded from their website and is available for Mac and PC. Air Mouse Pro has similar features to Rowmote but supports custom media layouts, programmable hotkeys and multi touch gesture support. It also supports an accelerometer mode which works like a laser pointer to control your Mac. Air Mouse Pro has so many features yet it’s also cheaper at £1.19. It doesn’t support the remote layout seen in Rowmote so it’s probably down to personal preference as to which is better. I’ve found Rowmote Pro more reliable in use than Air Mouse but it’s handy having a Windows option on the iPhone so i have both installed. An option worth considering is Keymote (iTunes link). Once the helper app is installed Keymote becomes a keyboard and shortcut enabler. Once the App is paired with the Mini you will see it comes with a few default keysets for DVD Player, Front Row and Expose. They are presented well and allow you to send keyboard shortcuts to the Mini. Note this isn’t a mouse and keyboard replacement – it almost feels like a keyboard extender. You can also create your own Keyset’s for any applications you have installed. 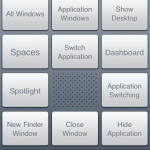 Creating your own Keyset is fairly straightforward on the iPhone but it can be a bit awkward moving the key’s around. You can’t choose the size of the keys but you can swap between white and black keys to contrast the layout and the layout can be larger than the screen as you can swipe up and down through the layout. If creating your layout isn’t your thing, Keymote comes with it’s own Store from where you can download other users Keyset’s. This is a great feature and saves a lot of time but there are many duplicates in the Store so it’s a case of trying the 6 or 7 iTunes layouts before settling on one that suits. You can also upload your own Keymotes to the store if you’ve made something unique or better than what’s out there already. This is a lovely app, almost a companion to Rowmote rather than a replacement. It also has uses beyond the Mini. Keymote can be used alongside a normal keyboard like an extender meaning common tasks could easily be applied to a custom Keyset. I’m already looking at Fastscripts and Keymote as a great combination to easily launch custom scripts from the iPhone. A free alternative to these products is Logitechs Touch Mouse (iTunes link). You again install a helper app which then allows you to connect to your Mac or Windows PC. Touch Mouse gives you a trackpad and keyboard, will display text on screen while typing and supports two finger scrolling. For free it’s excellent but I missed the app launching capabilities of Rowmote and Air Mouse. 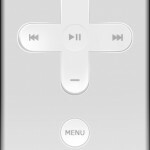 Another free option specifically for Boxee is the Boxee Remote (iTunes link). This requires you to setup the web server in Boxee (Settings > Network > Servers ensuring the Web Server is enabled on port 8800) and allows you to control Boxee in two ways – via Gestures or Buttons. Gestures works by dragging the Boxee logo around the app screen. Clicking in a text field displays a keyboard for text entry. It’s a good app but is really for Boxee only. Finally, a remote app to watch out for. 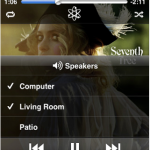 Remoteless is an up and coming remote for Spotify which will offer full control of Spotify from the iPhone. The video demo looks good and I’m hopeful this will be a great controller that allows for full access to desktop Spotify. Another way of remotely controlling your Mac is via screen sharing. You can connect from another machine and take full control of your Mini. This means day to day use can be via a remote or iPhone and when you need to tweak then do so via screen sharing rather than the Mini having it’s own dedicated mouse and keyboard. Off course this doesn’t just work locally. You can VNC to your Mini from outside your local network assuming you set up router and Mini to do so. This means that your Mini is always controllable from anywhere in the world. VNC is also available via a number of clients on the iPhone for those times when you have to access your home computer. It’s not ideal and the screen is small but it can be effective when needs must. This takes quite a bit to setup but opens up a number of interesting possibilities which I’ll cover in a future post. Hopefully this post has highlighted the variety of options available to you when it comes to controlling your Mini. I’ve settled on Rowmote Pro and Keymote on the iPhone, screen sharing and a very occasional use of keyboard and mouse. Even the use of screen sharing is only when I’m setting up some new software. Next up in the series is XBMC whose software is at the root of both Plex and Boxee. Previously only available as an add-on for a hacked Xbox it’s now available on Mac, Windows and Linux. I’ll take a look at how to set it up and also how to customise it as it has arguably the most active community driving it forward. Until then, happy controlling.